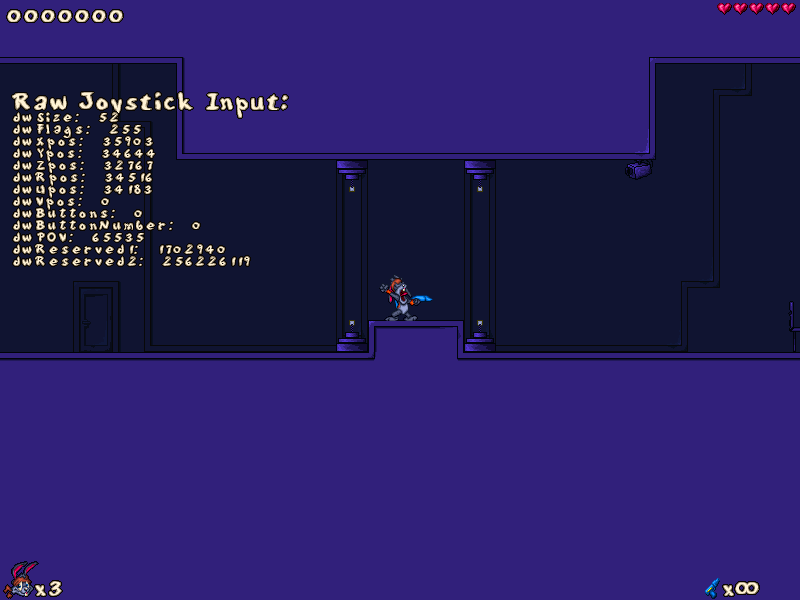 That's the latest release of JJ2+, minimally modified to constantly show all controller input information. 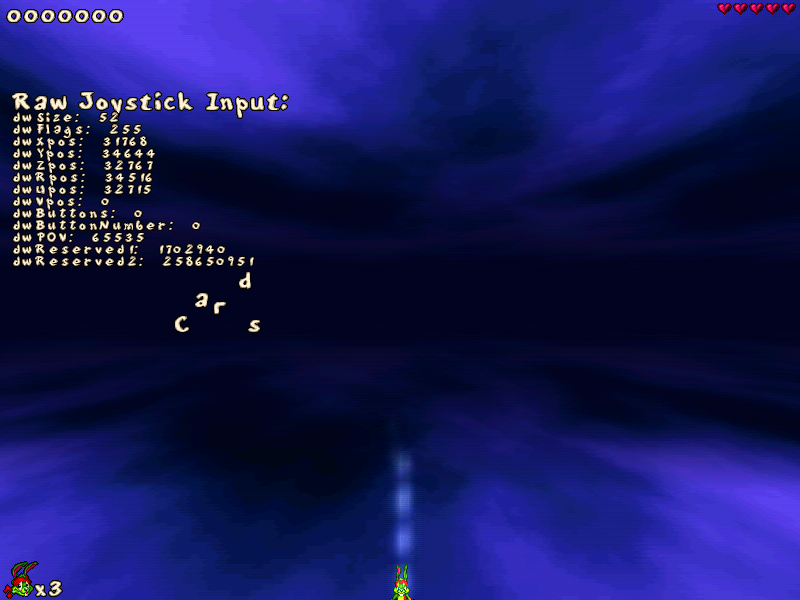 (Only while ingame--if your phantom controller makes it impossible for you to navigate the menu system, load JJ2 directly into a level by command line/drag+drop.) If you experience such phantom input, please a) explain what your specific problem is, b) post a screenshot of the various numbers in their base state (i.e. when you are not intentionally doing anything), and c) report how the numbers are affected by any related experiments you choose to do. 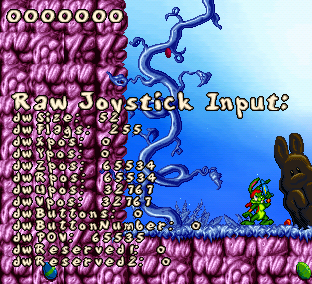 You know, I'm using the latest WINE stable release (3.9) to run Jazz Jackrabbit 2 and I'm have some really bad problems with my Sanmos TWIN SHOCK gamepad. One one the symptoms just happens to be "mouse pointer constantly moving to the left", so I figured that I'd report the problem here. 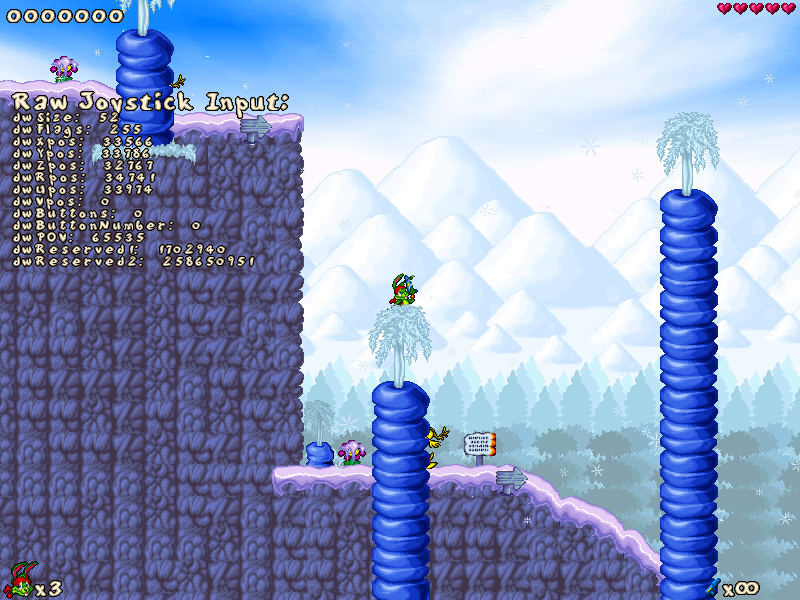 Another problem is that the player always looks up unless I move the stick into the up direction. From what I could gather, it seems that the stick only returns integers, which explains why the directional button works erratically; and dwPOV return numbers from 0 to 31500, being 65535 when nothing is pressed. 0029:err:hid_report: process_hid_report Device reports coming in too fast, last report not read yet! Combination of WINE and TWINSHOCK controller "moves the mouse cursor to the left in-game and some buttons work too fast on menus, directional keys don't even work properly and only the jump button works"
"In control joy.cpl, the 1,2,3 and 4 buttons flicker when pressed instead of just staying pressed... Also got the "device reporting too fast" error on the terminal when running WINE control joy.cpl"
"dwPOV shows from 0 to 31500, being 65535 when nothing is being pressed on the POV"
So, whenever I select a level from Home Cooked, and only from Home Cooked, the controller constantly registers movement right and down (EDIT: I have tested this further, and found this behaviour if I use the command line loading, but only for A Generic SP Episode II. 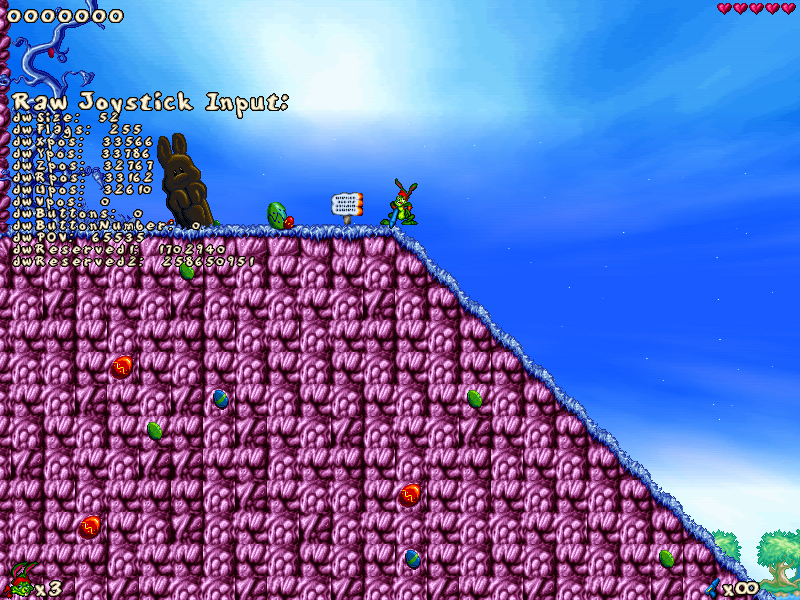 My own custom levels seem to not be affected by this. Perhaps it's memory usage related?). This includes it making me stomp whenever I'm in the air, for instance if I've jumped. It also doesn't let me manually move down or right at all. JJ2+ should now ignore corrupted controller data instead of seeming to constantly press the left and up keys." It looks like some Windows and WINE setups fail to "gnore corrupted controller data." When -nojoy argument is added, problem disappears but as it disables controller support, it's a bit pointless. Alternatively, Linux users can emulate keyboard buttons on controller with AntiMicro but that would be a dirty solution to be honest. Okay. Did you get any data from the plus_controller_diagnostics.zip I linked prominently in the opening post? Also, does your character constantly look up in regular JJ2 (without the JJ2+ patch applied) as well, or is your problem unique to JJ2+ v5.6? Sorry for late reply. Unfortunately I am not competent enough to make plus_controller_diagnostics.zip or regular v5.6 version of JJ2+ run with WINE manually. Lutris script that automates installation makes use of additional tools some of are AutoHotkey, Helper. Merging and overwriting Lutris installation with your diagnostics tool didn't provide the additional data shown in previous posts. - Characters do not constantly look up. - Controller buttons work without a problem, they can also be remapped. - No mouse cursor capture and/or shifting issue occurs. - Characters do look up constantly. - Most of controller buttons do not work. If up button is pressed, character stops looking up, but when you stop pressing, it returns to looking up. 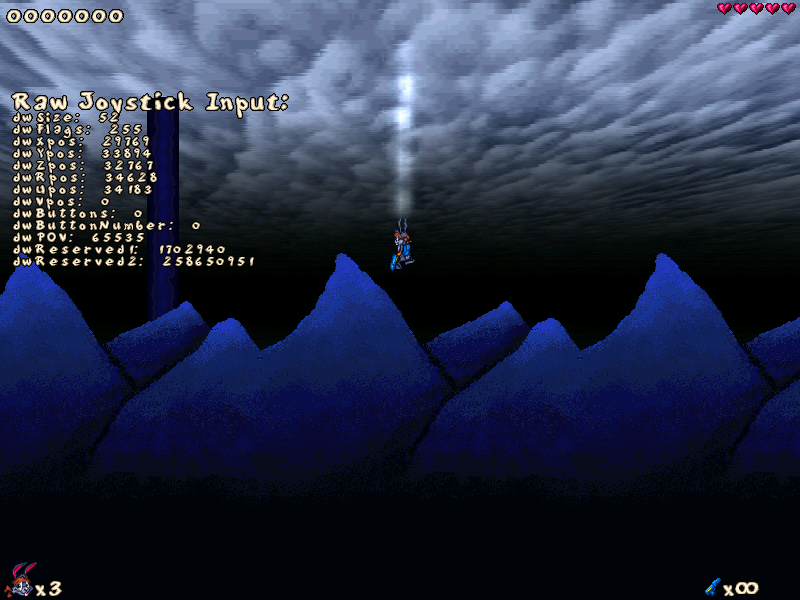 Jump, fire, pause, menu buttons work but down, left, right buttons do not work. Buttons cannot be remapped since up button is being constantly pressed. Up button works in menus but other direction keys do not work. 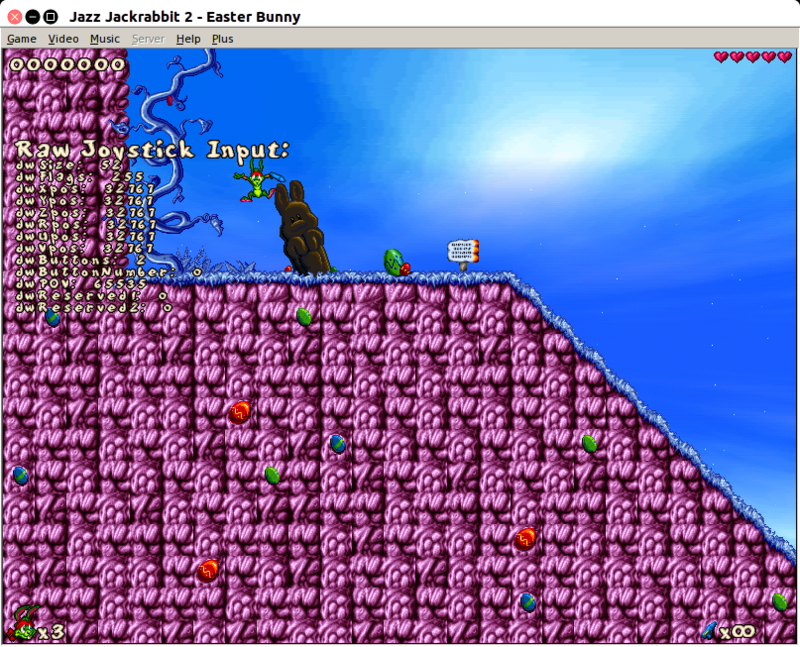 - Mouse cursor moves left in OS level if it is on the window of JJ2. Even if the cursor leaves JJ2 window, it keeps moving to the left edge of the desktop. 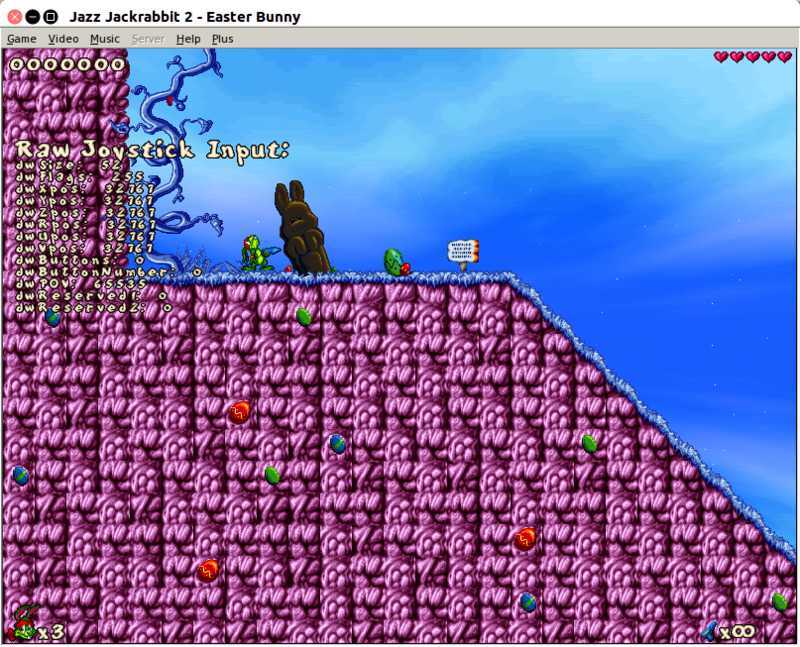 As March 2019, phantom controller input as well as moving mouse cursor issues with JJ2+ v5.6 still exist on Linux. By curiosity, I manually installed the game with WINE, applied 1.23 patch and JJ2+ v5.6 to bypass AutoHotkey, Helper files that Lutris script uses; the bugs are still there. Today, I found plus.zip version of JJ2+ v5.5 on archive.org; edited Lutris script to replaced JJ2+ v5.6 URL with v5.5 URL, installed the game via edited Lutris script; lo and behold... And it worked without phantom controller input and moving mouse cursor issues!